February saw many Harriers upping the mileage as spring marathon and half marathon training got well underway. This month also saw the culmination of the cross country season with some great results from the Harriers aswell as the second race of the Instep Devon championship series, so plenty to report on. The last race in the North Devon Cross Country League took place in West Buckland on Sunday 5th February. The course was challenging, cold, muddy and hilly but that didn’t stop Ben Stone from storming home in 21.00 to win the race. This placed Ben 7th in the league overall. Great result – well done Ben. Also taking place was the Fulfords Five race. Organised by Exmouth Harriers, this is a 5 mile, 2 lap race around Exmouth and is part of the Instep Devon Championship. Congratulations to Serane Stone who finished in a fantastic 29.39 and was 1st lady. The next race in the series is the Exeter Age UK 10k on Sunday 19th March full details on all the races in the series and current standings here. Lastly 3 Harriers ventured down to Dawlish to take part in the first race of the Exeter Triathlon Club’s Aquathon Series. Hannah Brown took part in the novice race which involved a 300m swim and a 2.5k run and finished 3rd lady in a time of 21.34 (7.09 swim and 14.25 run) – great result Hannah. Alan Ledger and Terry Fullick took part in the sprint race which involved a 600m swim and a 5k run. Alan completed in a time of 31.30 (8.54 swim and 22.46 run) and Terry in 50.00 (12.04 swim and 37.56 run). Well done Alan and Terry. If any other Harriers are interested in this series more details can be found here. 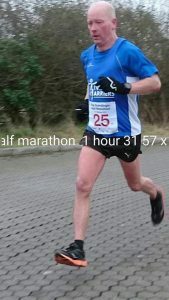 Martin Brace took part in the Humdinger Half marathon on Sunday 12th February. With over 1,000ft of ascent The Humdinger is billed as one of the toughest Half Marathons in the area with runners being rewarded with some stunning views of the Quantocks and the Bristol Channel. Martin finished in 1.31.56 placing him 2nd M45. Brilliant running Martin. 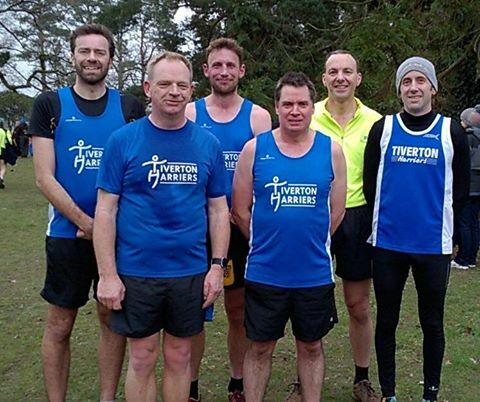 The penultimate Westward Cross Country League fixture also took place on Sunday 12th February in Stover, Newton Abbot and there was a fantastic turnout from the Harriers with 6 taking part, including Luke Holway and Jeff Curd competitively running as Harriers for the first time. Great results and well done to Alan who managed to knock 5 minutes off last years time. The 6th and final race takes place on Saturday 25th March in Redruth details here. Good luck to Alan and Ben who who need to run the last fixture to quality for the overall series with 5 out of the 6 races to count. Westward League LtoR Back: A Ledger, B Stone, J Curd. LtoR Front: R Kemp, L Holway, S White. No race roundup would be complete without James Morrison running up a welsh mountain and he didn’t disappoint in February. James ran the Pen Tir Drop Fell Race (4.2 miles; 1064ft ascent) in the Black Mountains, Wales finishing 22nd out of 51 in a time of 37:09. There was a good turnout from the Harriers for the Castle Hill Corker on Sunday 19th February. Organised by the South Molton Strugglers, this race involved 6 miles of multi terrain running around the Castle Hill Estate in Filleigh with highlights including running through the Tunnel of Doom, the Troll Bridge and Creepy Cliff and nearly 1000ft of climbing. Brilliant results – well done all. And lastly, Terry Fullick ran in the 5th and penultimate round of the Minehead Seafront 5k Series and finished in 26.35 placing him 2nd vet 50-60. Great running Terry. Good luck to everyone who has races coming up in the spring. Training in the dark will soon thankfully be behind us and we are only a matter of weeks away from lighter evenings, with Thursdays runs getting out onto the lanes which I am sure we are all looking forward to.